What Are the Four Market Models in Economics? 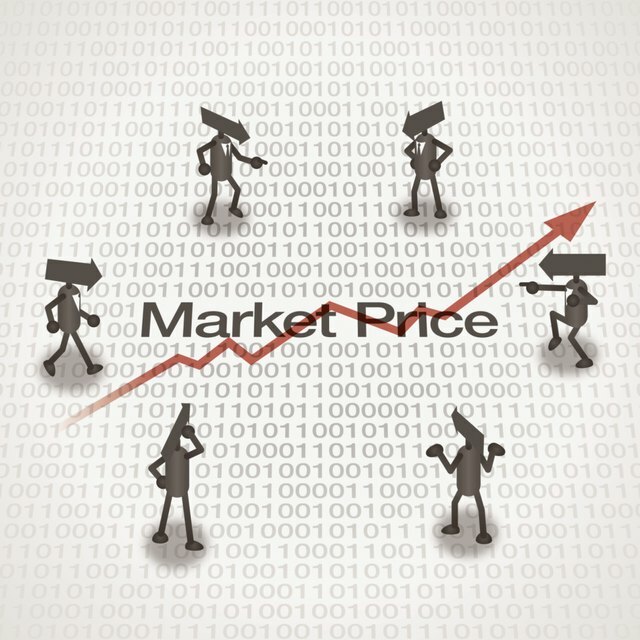 The four market models in economics are fundamental concepts that apply to the economic structure supporting individual companies and industries, and they are the basic framework that dictates how sellers sell and buyers buy. What Are Markets in Economics? It isn't incorrect to think of everyday places like flea markets, malls and the New York Stock Exchange as markets, but the modern term tends to speak to overarching ideas and broader strokes, like commodities and industries, rather than specific products or places. Whether speaking about the “real estate market” or the “labor market” or commodities markets, the fundamental principle is that everything comes down to supply and demand, which fuels what we buy and what is sold. The buying and selling of goods in any market can go one of two ways. One, someone has a good to sell and will sell it for whatever price the market dictates is fair. An example of this is the sale of coffee or rice or pork bellies, where the market buyers set the price based on what they’re willing to pay for these raw materials compared to the supply available at that time. In the other approach, the seller sets the price of their product and consumers must pay their price – think of finished goods like cars, smartphones, televisions and clothing. Consumers still have power in this market, because they can choose to buy competing products or simply refuse to buy a good or service. Then there are four kinds of markets, which fall into two basic categories – perfect and imperfect competition. Perfect Competition, also known as pure competition, is a stand-alone category and the first kind of market. In it, many different sellers compete, while the laws of supply and demand dictate pricing and availability of their merchandise or services. Entering or exiting the market as a business is easy to do, as regulations are not prohibitive. Their consumer awareness is also unfettered, as information about products and quality are openly known because the products are virtually indistinguishable from each other. Few examples of perfect competition exist, and it’s essentially more of a theoretical comparison point for academics rather than a practical model. But the closest examples would be agricultural markets, like soybeans or corn. On the other hand, “imperfect competition” includes markets like monopolistic competition, monopoly and oligopoly. Monopolistic Competition is almost a blend between perfect competition and monopoly, in which products are very similar, but the small differences between them are the basis of how their makers sell and advertise the products. Consider a Samsung smartphone versus iPhone. They are mostly the same in what they accomplish for the end user – they receive calls, take photos, surf the web, allow for other communications and are a computational device. And yet, vast sums are spent in marketing the two as being worlds apart, which is based on camera traits, feel, operating systems and other qualities that dictate brand loyalty. When one producer creates a successful product or enterprise, it attracts others in search of the same profits. From smartphones to beauty salons, there is little theoretical difference in what most products or services offer, but the differences are enough to build brand identity around. iPhone is a great example of a company that had a near monopoly based on creating a completely new standard of technology. But their success inspired others, like Samsung, to invest more in developing their own competitive products. Pure Monopoly models are where a single product or maker controls the market. There are no competitors, and the provider can theoretically drive up prices as they like. Examples of pure monopolies include entities like utility companies and government-run liquor stores. Naturally-occurring monopolies are ones which happen because their industry is so cost-prohibitive to enter that they are the lone player. Railways, for instance, are monopolistic because laying new track and establishing new routes is so unfeasible for newcomers to the industry. Some "unnatural monopolies" are instances where companies have been found guilty in antitrust lawsuits, like diamond wholesaler De Beers, who had a $295-million judgment against them for their attempts to monopolize the rough diamond trade in South Africa. They did this by fixing prices, restricting supplies and damaging smaller companies and entrepreneurs, while stifling innovation in the industry. Oligopoly models can be where a select few companies collude to control market prices in mutually beneficial ways, or where there is so little competition that each company is influenced by the adversaries’ choices, which dictates how they market their services or products and at what prices. There are pure oligopolies, such as the oil industry, where someone undercutting the competition would damage the market as a whole, but where higher prices would benefit the market, too. And this is where collusion can occur. There are also “differentiated oligopolies” where the industries can be expensive to enter, and therefore the competition is scarce, allowing for very similar products or services sold. An example would be the airline industry, where, for instance, baggage fees were nearly unheard of a decade ago, but now seemingly everyone has them. What Type of Market Is the United States? A general misconception is that the United States is a pure capitalist market founded upon pure competition. In actuality, the U.S. is a mixed economy, with both socialist and capitalist roots. To be an absolute free market economy, there could be no government-owned property. Everything would need to be privately owned. There would be true supply-and-demand pricing with no regulation from the government. There would be no industry oversight. But free market economies are an abstract idea and absolutes do not exist in the world. Instead, America is a variation on a theme that exists in many countries – some capitalism, some socialism. This is what is called a mixed economic system. There are centrally planned economic controls spearheaded under the federal government, but there can also be regional controls administered by governments of states, counties and cities. The socialist element comes in the form of the government controlling the delivery of services like education, roadway maintenance, water utilities, emergency services, policing and so forth. When taxation is collected on income or the sale of controlled goods like gasoline and cigarettes, it's socialist-economist theory. Taxes are collected to the benefit of the greater good. As an example, roadways are important to have maintained because they allow for the free flow of people and goods, which is, in turn, beneficial to citizens and businesses, as well as regional economies. Fire departments are paid for from public taxes because they’re for the greater good, too. After all, fires can destroy whole cities – just look at Chicago’s great fire of 1871, which destroyed over $222 million in property, which represents billions today. Even the national defense plan is a result of a socialist policy. Regulation in business is widespread in the U.S., making it far from a free market. Want to be a hair stylist? You may need both a certification and a business permit. To sell real estate, you’ll need a license. To sell food products, you might need approval from the Food and Drug Administration. If you’d like to advertise your company, you’ll need to do so in a way that meets the Federal Trade Commission’s standards. Arguably, America takes the best elements of both the free marketplace and socialism and combines them for one of the most exciting economic markets in the world. Monopolistic competition is probably the economic market you see the most in the world around you. Its defining traits are that barriers to entering the market are relatively low, allowing for greater competition, but that products and services are relatively similar, making competition even stronger. Fast food restaurants are an example of monopolistic competition. While one might offer Mexican meals and another is a classic hamburger joint, it’s the nature of their business which puts them in the class of being monopolistic competition. Each seeks to provide consumers with meals that are competitively priced, served in the same quick time frame while being convenience-packaged for either dining in or takeout. Automobile companies are engaged in monopolistic competition as well. You may have a range of vehicles available for different lifestyles at different price points, in a variety of options and colors, but there are only a few companies from which you can choose. Ford, GM, Toyota, Fiat-Chrysler, Honda, Hyundai, some European manufacturers and so on, are all competing to be your latest auto, but once you break vehicles down into budgets, types and classes, your options get considerably narrower. Because these are such expensive industries to enter, it’s seldom you ever hear of a new player in the market – and this is the defining trait of monopolies. What Are Four Characteristics of Pure Competition? Pure or perfect competition is rarely seen in the economic world. A good place to find best-case examples of it is the agricultural commodities market or in gasoline sales. To be perfect competition, there are four criteria that need to be met. Identical Products: Each seller must sell the same sort of product. Take the oranges commodity. There are different varieties of oranges, but a mandarin orange is a mandarin orange; a navel orange is a navel orange. Someone might claim to have better soil or greater weather conditions that yield a tastier orange, but it’s still an orange. Easy Entrance: Beginning a business is easily done and doesn’t have prohibitive regulation. For instance, if someone wants to sell oranges, they must only have land, be able to plant orange trees and produce good-quality crops that the market will consider saleable. Many Sellers: There is no stranglehold on the industry, and no one has the advantage over the next competitor. They may have a lower cost because of their overhead or how they’ve amortized things, but there is plenty of competition. In the oranges example, Florida has 4,000 growers employing 76,000 people in an industry that accounts for $9 billion sales annually, second only to Brazil in worldwide clout; all selling a few varieties of one thing – oranges. Perfect Information: This is the aspect that most limits a market’s ability to be pure competition because it’s so difficult to get the equivalent information on each product and supplier – even in the internet age. When considering oranges, perhaps the information is spotty on one seller versus the next – like where specifically the oranges hail from, what quality of soil they're grown in and how clean or safe the soil and water supplies are for this grower’s Valencia oranges versus Martin’s Magical Grove a few miles away. When it comes to an edible product like oranges, this information affects the product’s end sale to, say, a healthier-living food store where they could command a higher wholesale price than maybe some low-market produce shop on an income-challenged side of town. Realistically, perfection isn’t possible – not in people, not in products and not in markets. But agricultural markets come close to being pure competition, and it’s why the lower, more competitive profit margins can make the agricultural industries tough to survive when losses accumulate. That accounts, in part, for why Florida’s farmers are feeling the squeeze after repeated hurricanes, like Irma, have left the growers bruised. Today, the number of orange producers is nearly half what it was just a decade ago. Luckily for them, the U.S. is a mixed economic system, and federal aid is helping many to weather those tough financial storms. Investopedia: Is the United States a Market Economy or a Mixed Economy?